At first glance the family STEM Game Make 7 may remind you and your kids of the classic game Connect Four. 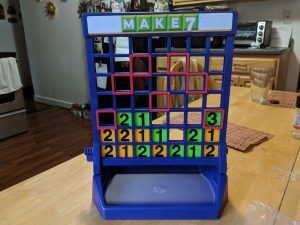 Both Connect Four and Make 7 involve dropping playing pieces into the game unit. However, there is a lot more to Make 7 than just getting four of your game pieces lined up in a row. In Make 7 the goal is to create a row of your playing pieces, which are numbered one, two or three, into a row that adds up to seven. Sounds easy? Wrong! Adding to the challenge, and fun, in this addition game is the fact that you can only use the #3 playing pieces in certain squares on the game unit. My family and I loved playing Make 7. The fun begins when you open the box and start to “assemble” the playing unit. The game comes with stickers that must be attached in specific areas. The directions are easy to follow and fun for kids. To be successful a player has to do some basic addition and think strategically. “Where should I drop my playing piece? What numbered piece do I play? Do I work on building my row or do I need to block my opponent?” It is a fast paced game that is lots of fun to play again and again. 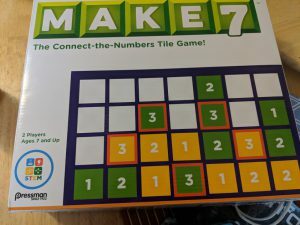 As a teacher, my wife thought Make 7 is an excellent game to get kids thinking about numbers and could get kids excited about Math. The game is for two players and is recommended for players age 7 and above.